While it may be tempting to use a barbecue or hibachi stove for indoor heating purposes, the fact is that charcoal gives off lethal amounts of carbon monoxide when it burns. Kerosene heaters should not to be used in the home, either, because they remove oxygen from the air. In fact, it's illegal to use them in a residence in the State of California for that reason. 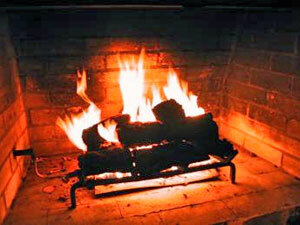 Every fireplace should have a sturdy screen across the front to prevent embers from flying or logs from rolling out. A spark arrestor across the top of a chimney will prevent sparks from igniting your roof or your neighbor's roof. Combustible items, including extra firewood, should be kept at least three feet from the fireplace opening. If you use manmade logs in your fireplace, follow package directions carefully; don't attempt to break a log up. Never use gasoline, kerosene, or any other type of flammable liquid to start a fireplace fire. Anytime we add any type of heat to our homes, the risk of uncontrolled fire increases. The Escondido Fire Department hopes you'll keep that in mind and wishes everyone a warm but safe winter.